This little guy is about 3 inches tall. 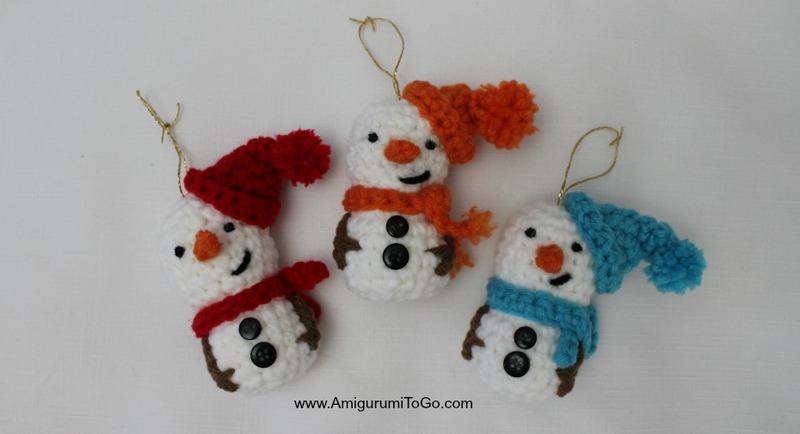 Makes a great tree ornament or stocking stuffer, could also hang it off of a gift. Add it to a winter wreath. There's many possibilities for this little snowman. I hope you enjoy making him! This is the first pattern I've published since August. I felt a bit rusty but soon I got into the swing of things again and writing up the pattern felt just like old times. 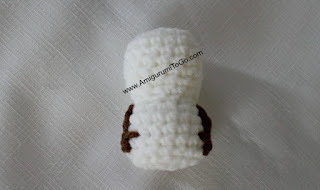 This is a small amigurumi which makes some of the parts a bit fiddly so it might not be the best pattern for a beginner. I do not have a video for this one, sorry. I've included photos and tried my best to make the instructions as clear as possible. Please do not hesitate to ask questions! There is a print friendly button at the bottom of this pattern. If you would like to leave a donation please do so by using the donation button also located at the bottom of this pattern. Thank you so much and enjoy! *stuff head. Shape as you stuff. *stuff some into body. Shape as you stuff. f/o leaving a tail long enough to sew up the gap. Weave in and out of the FLO of the remaining st. Before you close the gap, stuff the rest of the body and shape as you stuff. Use a stuffing stick, your finger or the back end of a pencil to push the stuffing into the right spots. Pull the yarn tail to close up the gap. Knot off and hide yarn tail inside body. *see FACE instructions below for where to put the eyes, mouth and nose and the order to do it all in. f/o. You can leave the nose as is or do what I do, fold chain and sew the edges closed. That way you'll have a more carrot looking nose. *see FACE below for where and how to sew the nose in. fold the last row upward, it should naturally fold where you crocheted in the FLO. Use the yarn tail to sew the edge in place if needed. 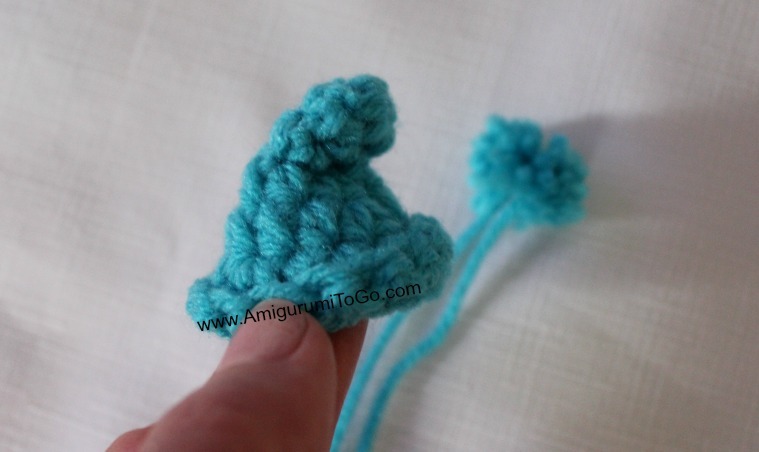 then bring the yarn tail up through the tip of the hat and sew the tip of the hat downwards as pictured. 1) ch29 * wrap the chain around the neck and see how long it is. It tends to be longer with some colors of yarn and shorter for other colors. If it's too long then remove a chain or 2. Sew the bottom end in between the 14th and 15th row, use the yarn tail to add in another tip to the *stick* as pictured by wrapping over 2 times. I put that one in between the 13th and 14th row. Add one more stitch in the middle of the stick, pushing the stick over just a bit to make it look bent. Bring the yarn tail out through the bottom of the snowman and leave it hanging. Sew the top end in between the 10th and 11th row. Bring the yarn tail out through the bottom of the body, through the same stitch hole the first yarn tail is, and knot them together. Cut yarn tails up a bit shorter and hide the knot in the body. Weave in one yarn tail and cut the excess off. Weave the other yarn tail up about 1/4 way up the scarf and use it to sew the scarf in place. Wrap the scarf around the neck, crossing the ends over each other. *Do this step after you have the stick arms sewn on. 3) Sew hat in place, off center, as pictured. 4) Glue the buttons to the belly. I used hot glue. 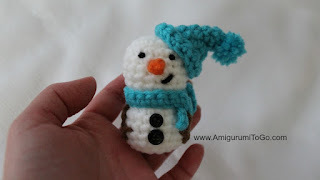 Be very careful with this if you use hot glue, the glue will not come off yarn so use very little, just a drop will do! I found placing the button on a pin then adding in a drop of glue helped keep my fingers out of harms way. I actually put the glue on the end of the pin, then used the pin to guide the button in place. I pushed the button off of the pin and it grabbed the glue on its way off. No mess that way! 5) Add the face now. I leave the face for last since I use paint. You want to be completely sure the paint is dry before doing anything with the doll. PLEASE note, these are suggestions only. If something doesn't look right to you then change it! Do what you think looks best. 5a) The nose is sewn in between the 5th and 6th row. Pull the yarn tails through the back of the head. You can add a dot of glue behind the nose before pulling the yarn tails tight. Knot off, cut up a bit shorter then hide the knot inside the head. 5b) Add the smile. Insert black yarn in between the 7th and 8th row, off center, then bring the yarn up and over just a bit in between the 6th and 7th row. Bring the yarn tails out through the bottom of the body and knot off. Cut up shorter and hide knot inside body. 5c) Add in the eyes. I used black paint and dotted them in between the 4th and 5th row with about 3 visible stitch holes between them. Feel free to use whatever you want for eyes. I found paint quick and easy and you can make them the perfect size. And lastly, add a string to the top of the head. 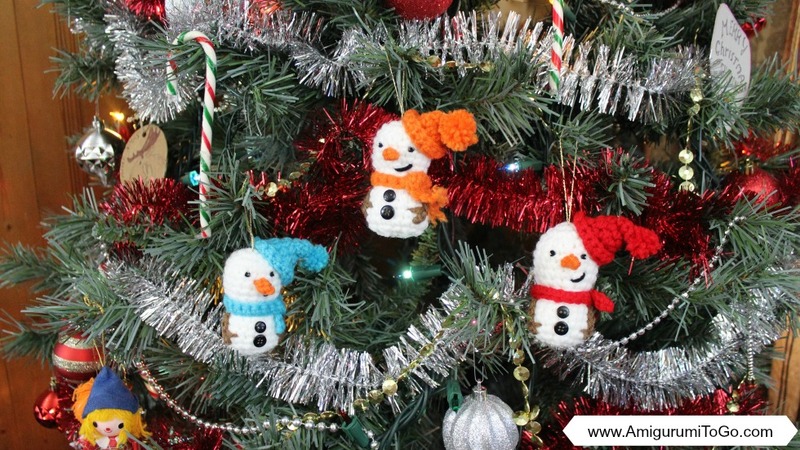 Although it looks pretty darn cute in the tree, I'm sure there's other places the snowman could go, the tree isn't it's only purpose in life. Glad to hear from you. Hopefully the rusty feeling is all gone. These snowmen are funny little guys. Thanks so much for the pattern. yes!! Thank you so much.. I've missed ur awesome creations more than u knw!!! Thnks for all u do & all ur hard wrk. If I was a millionaire I'd donate tons of $& to u. Miss u on YouTube plz come back when u have the chance. Love ur projects!! !